Sitia (Σητεία) is the city that has the most "the most" in its sleeve. It is the smallest city ​​of Crete, the easternmost, with the quietest atmosphere, and although it is the least developed compared to other Cretan cities, its residents are the most cordial to visitors. Less than 10,000 population of Sitia makes the city the smallest in Crete. Some even go a step further and say perversely that it is rather the largest village of Crete. I must admit that this statement has some truth, because the somewhat drowsy atmosphere that prevails here, actually resembles a Cretan village more than a city dominated by everyday turmoil. Even at the peak of the holiday season, you will not find too many tourists here. In part, this is due to the not very extensive tourist infrastructure, which is much smaller compared to the other cities of the island. Sitia is nothing like the bustling Chania or Heraklion . Regardless of whether a high tourist season is currently in progress or not, the rhythm of the city is taking place here at an unhurried pace. To this day, we remember our surprise when after 16:00 we tried to buy bread. At this time of the day, all the bakeries were already closed. The saleswoman of one of the few open greengrocers with a smile on her face acknowledged this fact only with a shrug and a commentary "but after all it is already after 6pm ...". As part of the help, she also directed us to the supermarket, where, according to her assumptions, only dakosy and hideous toasted bread were available on the shelves. The slow rhythm of life in Sitia and in its region makes this part of Crete a great place for people who do not look for nightlife on holidays and are not geared to visiting many tourist attractions. You can find, above all, peace and quiet, which is so lacking in other major cities. 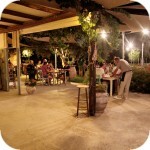 This region is also one of the few places on the island where you can taste the "real" Crete. The waiter's smile is not forced here, and the kindness is really honest. Although Sitia has its own airport, however, it is practically unused by travel agencies. Most tourists still get to Crete by landing at the airport in Heraklion , which handles the largest part of charter traffic. Separation of Sitia by 130 km from the capital of the island means that the city is still very little popular among Polish and foreign travel agencies. From Poland, there are mainly individual tourists so far reaching Sitia. The situation will definitely change when a large hotel complex to be built in the area of ​​Cape Sidero is put into use. Two years ago in Sitia a new terminal for them was put into service Vitsentzosa Kornarosa, which, however, currently only serves domestic flights and few charters. The number of aircraft landing and departing from here is still negligible. Local authorities associated great investment hopes for the development of the tourist sector there. For several years, attempts have been made to make the airport permanently in the network of charter connections implemented during the tourist season. Unfortunately, so far these efforts have not brought any major results. The existing charter connections between Sitia and several northern European cities from such countries as the Netherlands, France or Norway bthey were quickly suspended. A much more important function is played by the seaport , from which ferries run to some Dodecanese, Cyclades and Heraklion islands. Daily cruises are made to Piraeus in Athens. From Sitia, several times a day, KTEL buses to Heraklion, Agios Nikolaos and Makry Gialos located on the southern coast of the island. Sitia, however, is poorly connected with nearby small towns. In general, two courses per day are implemented. So if you plan to visit the east of Crete by KTEL public transport, we advise you to check the departure times well. Of course, you can also get to Sitia by car . The New National Road runs here, which runs along the entire north coast of Crete. The route is generally very good quality. However, behind the village of Kavousi, you will encounter a lot of corners, the defeat of which requires increased attention. They will also not allow for higher speeds. It is worth taking this into account when planning a trip. Directly to Sitia there is also a road leading to the southern coast of Crete. You can get there to Makry Gialos and then continue towards Ierapetra and further west of the island. It is a much slower route, the roadways are narrower, but thanks to the slower speed you can enjoy the villages and olive groves you have encountered. The first inhabitants of Sitia came from the Neolithic times. The Minoan city was built in the place of ancient Itia. Some say that it was here that Myson was born, counted among the seven wise men of antiquity, which, according to the preserved message, the Delphic oracle recognized him as the wisest man. The city flourished in Byzantine times, when it began to function as a commercial port. The high castle walls erected around the city and the Kazarma fortress were intended to protect the residents' safety. When the Venetians took over control over Crete, they considered the region important. Thanks to the development in all sectors, Sitia has become the largest city of eastern Crete. At that time, one of the largest representatives of Greek literature Vitsentzos Kornaros (1553-1613) was born near the city. His last name is today at the nearby airport. In the sixteenth century, a series of disasters came, as a result of which the city was destroyed many times. The great earthquake (1508) and the continuous invasion of pirates led by Barbarossa (1538) contributed to the destruction of a significant part of Sitia along with the defensive walls. An interesting fact is that the city's residents were forced to contribute financially (1500 ducats) to repair the entire defense system of the city. The reconstruction of the destroyed fortifications was still being attempted by the Venetians, however, the history was on the way. The 6th Venetian-Turkish war ended with the victory of the Turks, who took over the control of Crete. Before giving Sitia to the new occupant, the Venetians demolished the existing walls still existing. Residents of the city were moved to Heraklion, and in Sitia only a small garrison remained. The city fell into oblivion for the next two centuries. In 1869, Ayni Pasha founded a new city here, which was named in his honor by Ayna. Local peasants began to settle in it. Soon after these events, Crete regained its independence and the city's name was changed again. And although today the old defensive walls are invisible, the Kazarma fort is still evidence of the presence of ancient powerful fortifications. Historians are not sure whether the modern city was created in the place of the Minoan settlement. These assumptions, however, seem to confirm the few Minoan graves, figurines and Roman buildings found here. What to visit in Sitia? Towering over the city, a fort dating from the thirteenth century reminds of the times in which this building together with nonexistent presentand walls, it protected the city from intruders. The present shape of the fortress was given to the Turks who, after taking over the reign, realized its comprehensive reconstruction. Today, Kazarma is only used when organizing local cultural events. Although there is only a three-storey tower in the middle and stairs leading to the wall, it is worth coming here in Sitia. From the fortress walls there is a beautiful view of the city and the bay. The museum is relatively young because it was inaugurated in 1984. It was created after 50 years of efforts by various local institutions and residents of the city, who wanted Sitia to have its own place to collect and protect important archaeological finds from this region of Crete. Without these activities, artifacts found over the last 100 years in this area would be transferred to museums in Heraklion and Agios Nikolaos. And although this object is far from the impressive size of the Museum in Heraklion, we think it's worth a look. In this object, the most important archaeological finds from the area of ​​4000 years have been collected from the eastern part of Crete (Sitia, Palekastro, islets Mochlos and Psira, Minoan palace in Zakros, Xerokambos Makry Gialos, Koufonisi or Ancient Itanos). All finds are organized according to the area of ​​origin. The largest and richest group of exhibits consists of numerous artifacts from the Minoan palace in Kato Zakros. The oldest exhibits remember the Neolithic times, while the youngest come from the late Roman period. The most famous subject of the collection is a 50-cm ivory statuette from the Minoan city of Palaikastro. You will certainly pay attention to him, because he is specially exposed in a separate case in the central part of the main room. Sitia boasts a long, mostly sandy beach stretching to the east of the city. In the afternoons and at weekends it becomes a favorite place of relaxation for the city's residents. The water is shallow, so parents with small children are happy to be here. Tourists on this beach meet rather rarely. The beach has a fairly well-organized infrastructure, but there is also a lack of quiet, peaceful places, especially in its eastern part. An additional advantage is the beautiful view of Sitia which stretches from here. White amphitheatric buildings of the city rising above the waters of the semi-circular bay. From this distance and perspective, they look particularly picturesque. The eastern end of the beach closes Cape Trypitos, where the ruins of the ancient city of Trypitos are found. It was here that the ancient sage Myson was to come into the world. Ports in Sitia often have ferries coming from other islands. The characteristic rumbling of a sailing ship can be heard from a distance. On the approaching slowly colossus, you can look until you enter the port. Small fishing boats and private yachts also stop at the port. The benches along the coast allow you to observe blissful and unhurried life. A city boulevard with palm trees is surrounded by taverns and cafes. It is a kind of center, which, however, even in the evening does not fill the bustling crowd of tourists, well known from other cities of Crete. It is an ideal place for walking even in the moonlight. These semicircular structures are located 150 m from the customs office. The Romans kept fresh fish in them. There are ten of them on the two hundred meter stretch of coastline, but most of them are ruined. These are the best preserved Maydimensions of approximately 7 x 6,7 m.
What's interesting you can find nearby? In the area of ​​Sitia, tourists come primarily to see the famous Vai beach. In general, they also stop at the Moni Toplou monastery. Dismissing Sitia from popular tourist resorts and long travel times, however, means that you do not have enough time to explore the city itself and other interesting attractions nearby. In the meantime, there are a lot of interesting places around Sitia that will make you stay in this area for longer without boredom. Interestingly, most of them can be reached really fast because the distances here are not great. Unfortunately, a car or scooter is required to view the area. As we wrote above - local communication buses run quite rarely. This region also abounds in small but interesting excavations. Approximately 80 were counted throughout the area. This is a real treat for history buffs and amateurs of excavations. small archaeological sites, for example on Cape Trypiti , Petras, Presos, Chamaizi (a little further).